Perhaps more than any other factors, transportation modes have influenced the way cities grow and the forms they take. Before the advent of the automobile, cities were smaller and more compact in area and population. Travel between cities was arduous. Transport of goods and materials was generally limited to short distances. People walked, rode horses or burros, or traveled in animal-drawn carts. Trips for work, shopping, socializing, and business were limited to walking distance for most people. The introduction of the bicycle was a major innovation that substantially extended the range people could travel. Even today, the bicycle is a major mode of transportation in some countries of the world, such as China. It is used to haul heavy loads, pull trailers, and provide everyday transport. In these countries, the cost of driving is prohibitive for the average citizen. Per capita income is low, and the price of motor vehicle fuel and services is very high. Studies have shown that as per capita income rises, however, people switch to private motor vehicle ownership and the extent of walking and bicycling decreases. In the United States of the 20th century, urban design reflects the influence of the motor vehicle as the dominant transportation mode. Many cities have historic city centers and older neighborhoods that were designed to accommodate pedestrians. In many cities, these historic areas are preserved and showcased as relics of earlier times. People visit them for the unusual experience of leaving their cars behind and walking around. Neighborhoods and commercial areas that were designed in the post-World War II era are far less inviting to pedestrian travel. They typically lack sidewalks, and streets are wide and difficult to cross (see figure 1-1). People usually get in their cars to go to school, to work, or to buy groceries. Cities that concentrate all commercial development in large, single-use zones and that buffer these uses from nearby homes in ways that may screen out the lights and noise, but that also prevent pedestrian access. People can walk or bike to the shopping center, but only if they travel far out of their way and use major arterial streets. Cities with subdivision ordinances and street design standards that require wide streets and sometimes do not require sidewalks. The concept of multimodal or context-sensitive design— where motor traffic within neighborhoods is slowed and put on an equal footing with nonmotorized street users—is often not supported by standard design practices or is reserved only for special projects. Figure 1-1. Photo. Wide suburban streets like this one were not built to accommodate or encourage walking. Suburban streets are built for higher-speed traffic than are the streets in older parts of town. Therefore, speed limits are higher on the new roads. There typically is no roadway space allocated to bicyclists. People perceive these streets as dangerous for bicycling, and they lack the skills and confidence to ride on them. Use of public transportation in suburban locations is often difficult. Effective public transit requires a higher density of users. Suburban schedules provide service at infrequent intervals. It is usually faster to drive than to take the bus. Often, barriers to bikes and pedestrians are created because developers and roadway designers (as well as the codes and regulations they are required to follow) are mainly concerned with motor vehicle traffic circulation (see figure 1-2). Bikes and pedestrians are generally not allowed at drive-up windows for banks, restaurants, dry cleaners, and similar establishments. Parking garages may allow direct access into adjoining office buildings, but what if the customer wants to park a bicycle or walk up a ramp to the street? Construction zones may put pedestrians and bicyclists at risk. Snow removal routinely piles snow along the curb, forcing bicyclists to the middle of traffic lanes. While these conditions are improving in many cities where new policies have been put in place, numerous barriers remain. Figure 1-2. Photo. Many modern developments are designed to cater to automobile travel. Urban design practices have come full circle as planners and engineers have begun to recognize the value in providing neighborhoods and commercial areas that are pedestrian- and bicycle-friendly. In many cities and towns, zoning ordinances and subdivision design regulations have been revised to ensure that new developments are designed to encourage walking and bicycling. According to the 2001 NHTS, nearly half of all travel trips taken in the United States are 4.8 kilometers (km) [3 miles (mi)] or less in length; 28 percent are less than 1.6 km (1 mi). (3) By taking advantage of the opportunity to convert short automobile trips to bicycling and walking, communities can reap significant benefits from healthier air and reduced traffic congestion. Increased levels of bicycling and walking can play an important role in reducing air pollution. According to the Environmental Protection Agency (EPA), approximately 160 million tons of pollution are emitted into the air each year in the United States. A serious threat to public health, air pollution contributes to the deaths of 70,000 people nationwide each year, according to an estimate from the Harvard School of Public Health. For many households, a motor vehicle is typically one of the highest expenses after housing. The option of bicycling can improve mobility for people who cannot afford to own and operate a motor vehicle, and would allow some households with autos to own one vehicle instead of two. Pedestrian and bicycle transportation allows people to incorporate physical activity into their daily lives (see figure 1-3), which reduces health care costs and morbidity rates. Figure 1-3. Photo. There are many economic benefits to building bicycle and pedestrian facilities like this shared-use path. Outdoor activities such as bicycling and walking are the most popular activities for people on vacation from work. They are more popular than visiting museums or national parks, doing beach and water activities, and shopping. Businesses invest in locations that have a high quality of life. Corporate employers have an easier time attracting highly skilled workers to these locations. 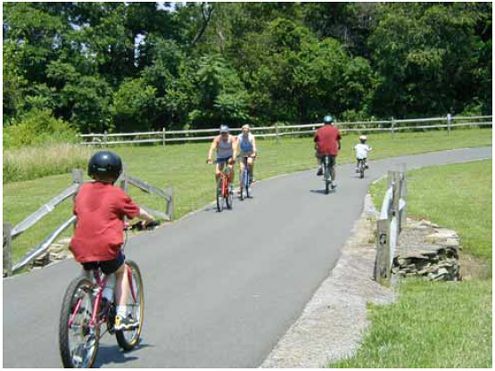 According to the National Bicycle and Pedestrian Clearinghouse, trails and greenways can have a positive effect on the value of nearby properties. (6) Recent studies of the preferences of new homebuyers indicate that there is a demand for more livable communities and, specifically, better bicycle and pedestrian facilities in the vicinity. Pedestrians add to the ambience and security of streets. Providing a livable community is a necessary part of attracting and keeping businesses, and ensuring local communities remain competitive in the 21st century. A number of research studies have shown a correlation between the built environment and the amount of routine physical activity, such as regular walking trips. A study published in the September 2003 issue of the American Journal of Health Promotion titled "Relationship between Urban Sprawl and Physical Activity, Obesity, and Morbidity" found that people living in sprawling counties "were likely to walk less, weigh more, and have greater prevalence of hypertension than those living in compact counties. "(7) An earlier study published in the American Journal of Preventive Medicine showed a direct relationship between the amount of walking and the age of the home in which a person lives, as a proxy for the style of urban residential development that is common in older versus newer communities. (8) People who lived in older homes were found to walk more. Numerous studies have shown tremendous benefits from even a brief amount of light but routine exercise each day (see figure 1-4). Bicycling or walking to the store, school, or work also provides a time-efficient way of attaining the U.S. Surgeon General’s recommended daily allowance of physical exercise. Pedestrian and bicycle transportation offers more opportunities for people to socialize than driving alone in automobiles. Figure 1-4. Photo. Walking can have a tremendous health benefit. Government support at the Federal, State, and local levels is critical to ensuring that the transportation system accommodates bicycling and walking. Whereas individuals and private organizations can accomplish much in increasing public awareness, identifying needs, etc., the creation of safer and more appealing places to bicycle and walk is primarily a responsibility of government. This is accomplished not only through direct improvements to the roadway environment, but also through planning, policymaking, and other government activities. Support and commitment at every level of government are thus the keys to significant increases in bicycling and walking as modes of transportation. Leading the way in Federal support for bicycling and walking was the Intermodal Surface Transportation Efficiency Act (ISTEA). That act initiated a major policy shift in Federal funding priorities in the United States by making Federal funds much more accessible for State and local bicycling and walking facilities and programs. (12) Subsequent Federal transportation bills have strengthened the emphasis on improving conditions for bicycling and walking. Following the adoption of ISTEA, the U.S. Department of Transportation (USDOT) published the National Bicycling and Walking Study (NBWS) in 1994. (13) NBWS translated the recognition of nonmotorized travel embodied in ISTEA into two specific goals: to double the percentage of trips made by foot and bicycle while simultaneously reducing the number of crashes involving bicyclists and pedestrians by 10 percent. State and metropolitan planning organization (MPO) long-range plans are to "provide consideration of strategies that will increase the safety and security of the transportation system for motorized and nonmotorized users." Bicyclists and pedestrians shall be given "due consideration" in State and MPO plans. Bicycle and pedestrian facilities are to "be considered, where appropriate, with all new construction and reconstruction of transportation facilities." "The Secretary of Transportation shall not approve any project or take any regulatory action that will result in the severance of an existing major route, or have an adverse impact on the safety of nonmotorized transportation traffic and light motorcycles, unless such project or regulatory action provides for a reasonable alternate route or such a route already exists." "In any case where a highway bridge deck being replaced or rehabilitated with Federal financial participation is located on a highway on which bicycles are permitted to operate at each end…and the Secretary determines that the safe accommodation of bicycles can be achieved at reasonable cost, the bridge shall be so replaced." "To varying extents, bicyclists and pedestrians will be present on all highways and transportation facilities where they are permitted and it is clearly the intent of TEA-21 that all new and improved transportation facilities be planned, designed, and constructed with this fact in mind." "We expect every transportation agency to make accommodation for bicycling and walking a routine part of their planning, design, construction, operations, and maintenance activities." "Bicycling and walking ought to be accommodated, as an element of good planning, design, and operation, in all new transportation projects unless there are substantial safety or cost reasons for not doing so." It is to be presumed that bicyclists and pedestrians will be accommodated in the design of new and improved transportation facilities. The decision NOT to accommodate them should be the exception, not the rule. Any circumstances for denying access through design or prohibition must be exceptional. States have responded to the challenges of the Federal legislation, and many are already ahead of its requirements. As mandated, bicycle and pedestrian coordinators are in place in all 50 States, and some State departments of transportation (DOTs) maintain programs that are staffed with several professionals who focus solely on bicycle and pedestrian planning and design issues. Florida DOT is one of the leaders in this regard, with six staff members who spend 80 percent or more of their time on pedestrian- or bicycle-related work, two who spend 50 percent or more in this area, and many additional staff who spend a smaller portion of time on pedestrian and bicycle issues. MPOs and individual communities have also responded to the mandates and opportunities of the Federal legislation. The infusion of Federal funding for bicycle and pedestrian projects has galvanized local commitments of funding throughout the country. FHWA has estimated that in the 18 years prior to ISTEA, a total of $41 million of Federal funds were spent on bicycling and walking, for an average of $2.3 million per year. By the year 2003, that figure had risen to $422 million per year. This infusion of funding has fueled a large rise in the number of new shared-use paths, bike lanes on urban streets, and sidewalk improvements throughout the country. More and more professionals have become involved in working on transportation issues related to bicycling and walking. The Association of Pedestrian and Bicycle Professionals, founded in 1995, reported a membership of over 450 professionals by the year 2003. Bicycle and pedestrian projects are broadly eligible for funding from almost all the major Federal-aid highway, transit, safety, and other programs. Bicycle projects must be "principally for transportation, rather than recreation, purposes" and must be designed and located pursuant to the transportation plans required of States and MPOs. National Highway System funds may be used to construct bicycle transportation facilities and pedestrian walkways on land adjacent to any highway on the National Highway System, including Interstate highways. Surface Transportation Program (STP) funds may be used for either the construction of bicycle transportation facilities and pedestrian walkways or nonconstruction projects (such as maps, brochures, and public service announcements) related to safe bicycle use and walking. The modification of public sidewalks to comply with the Americans with Disabilities Act also is eligible for STP funds. Ten percent of each State’s annual STP funds are set aside for Transportation Enhancement Activities (TEAs). The law provides a specific list of activities that are eligible TEAs and this includes "provision of facilities for pedestrians and bicycles, provision of safety and educational activities for pedestrians and bicyclists," and the "preservation of abandoned railway corridors (including the conversion and use thereof for pedestrian and bicycle trails)." Another 10 percent of each State’s STP funds are set aside for the Hazard Elimination and Railway-Highway Crossing programs, which address bicycle and pedestrian safety issues. Each State is required to implement a Hazard Elimination Program to identify and correct locations that may constitute a danger to motorists, bicyclists, and pedestrians. Funds may be used for activities such as a survey of hazardous locations, projects on any publicly owned bicycle or pedestrian pathway or trail, or any safety-related traffic calming measure. Improvements to railway-highway crossings "shall take into account bicycle safety." Congestion Mitigation and Air Quality Improvement Program funds may be used for either the construction of bicycle transportation facilities and pedestrian walkways or nonconstruction projects (such as maps, brochures, and public service announcements) related to safe bicycle use. Project applications for these funds must demonstrate an air quality benefit. 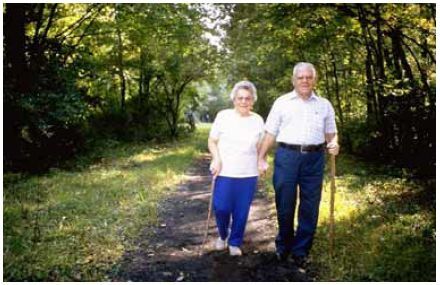 Recreational Trails Program funds may be used for all kinds of trail projects. Of the funds apportioned to a State, 30 percent must be used for motorized trail uses, 30 percent for nonmotorized trail uses, and 40 percent for diverse trail uses (any combination). Provisions for pedestrians and bicyclists are eligible under the various categories of the Federal Lands Highway Program in conjunction with roads, highways, and parkways. Priority for funding projects is determined by the appropriate Federal Land Agency or tribal government. National Scenic Byways Program funds may be used for "construction along a scenic byway of a facility for pedestrians and bicyclists." Job Access and Reverse Commute Grants are available to support projects, including bicycle-related services, designed to transport welfare recipients and eligible low-income individuals to and from employment. Title 49 U.S.C. (as amended by TEA-21) allows the Urbanized Area Formula Grants, Capital Investment Grants and Loans, and Formula Program for Other Than Urbanized Area transit funds to be used for improving bicycle and pedestrian access to transit facilities and vehicles. Eligible activities include investments in "pedestrian and bicycle access to a mass transportation facility" that establishes or enhances coordination between mass transportation and other transportation. TEA-21 also amended Title 49 to create a Transit Enhancement Activity program with a 1 percent set-aside of Urbanized Area Formula Grant funds designated for, among other things, pedestrian access and walkways, and "bicycle access, including bicycle storage facilities and installing equipment for transporting bicycles on mass transportation vehicles." Pedestrian and bicyclist safety remain priority areas for State and Community Highway Safety Grants funded by the Section 402 formula grant program. A State is eligible for these grants by submitting a Performance Plan (establishing goals and performance measures for improving highway safety) and a Highway Safety Plan (describing activities to achieve those goals). Regardless of the commitment of Federal, State, and local governments to bicycling and walking transportation, and regardless of the walkability or bikability of our cities and towns, the full potential of bicycling and walking as transportation modes will not be realized if the public is unable to embrace them as viable transportation options. Both government and the private sector can play key roles here by working to increase public awareness of bicycling and walking and actively promoting their use. Programs to increase levels of nonmotorized transportation, including innovative transportation demand management plans, bike-to-work activities, Safe Routes to Schools programs, and other promotional efforts, all can help to popularize nonmotorized transportation. DOTs at the State level are adopting policies that support nonmotorized transportation. Figure 1-5. Photo. Many State DOTs are adopting "complete streets" policies. Examples of States with complete streets policies include California, Florida, Kentucky, Oregon, South Carolina, Tennessee, and Virginia. A number of other States are in the process of developing new guidance in their roadway design manuals that incorporates better accommodations for pedestrians and bicycles, including Massachusetts, New Jersey, and Pennsylvania. 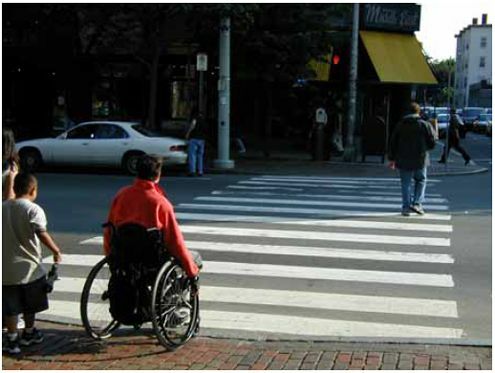 The concept of complete streets includes provisions to make streets accessible for all users, including those with disabilities. Increasing the accessibility for users with disabilities increases the accessibility for all users. Trends in community design and redevelopment are moving to accommodate and encourage walking and bicycling. In all parts of the country, there has been increased focus on pedestrian-oriented design. Once-deteriorating downtowns are being rediscovered and revitalized, often with a strong pedestrian emphasis. In some communities, this new focus began with the introduction of new urbanist developments and has then led to a more comprehensive reexamination of zoning and subdivision regulations that have traditionally favored automobile access. Communities in every State have begun the labor-intensive process of rewriting their development guidelines to either encourage or require mixed-use development and higher densities. Communities across the country increasingly require developers to provide sidewalks and bikeways, and decreasingly fewer planning boards allow exemptions from these requirements. Many planning processes are recognizing and addressing the need for coordination and cooperation with other professional disciplines as well as with citizen groups, city maintenance departments, police officers, school officials, and others. Creating pedestrian- and bicyclist-friendly cities takes cooperation and a big-picture approach backed by the power to put forward adoptable recommendations with policy or regulatory status. There is a surge of interest in Safe Routes to Schools programs. 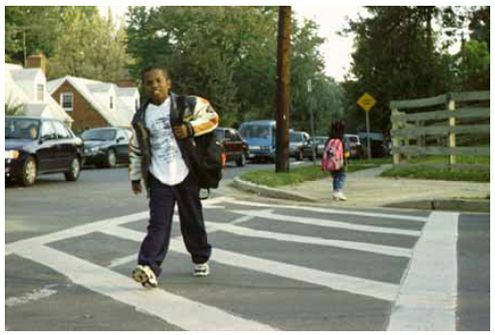 Galvanized by the success of Walk-to-School Day—a national promotional event held in early October of each year—State and local governments across the country are initiating Safe Routes to School programs (see figure 1-6). These programs are typically grassroots efforts among concerned parents, teachers, and community planners to improve walking conditions near schools, educate children on safe walking and bicycling skills, and promote walking as a healthy alternative. Figure 1-6. Photo. Safe Routes to School programs are being implemented throughout the U.S.
Marin County, CA: A combination of funding was used to establish the pilot Safe Routes program in Marin County, including funds from the County, NHTSA, several private foundations, and the Bicycle Coalition. Traffic congestion was a considerable issue for this Safe Routes program—an estimated 21 percent of morning rush hour traffic consisted of parents dropping children off at schools. The program grew from an initial nine pilot schools and 1,600 students in 2000 to 23 schools and 12,000 students in 2003. The results were impressive: a 57 percent increase in children walking and biking, and a 29 percent decrease in children arriving by car. Arlington, MA: This program also used a combination of funding and support from private corporations such as New Balance, the American Automobile Association (AAA), and the Robert Wood Johnson Foundation. Public sources included the City of Boston, Massachusetts Highway Department, and the National Park Service. The program began with three pilot schools in 2000, and expanded to several more schools in 2001–2003. At one elementary school, 38 percent of students walked prior to 2000. By June 2002, 56 percent of students walked to that school. In urban and suburban areas, a network of shared-use paths and onroad bikeways for nonmotorized transportation is growing. Trail systems provide continuous, scenic, and grade-separated access to major destinations using canal banks, flood control channels, river corridors, parks, and greenbelts. Built to current design standards, these trails can serve many types of users for many different trip purposes. Cities and towns of all sizes have continued to add miles of shared-use paths, forming a growing network of trails throughout the U.S. Projects like the East Coast Greenway—a proposed urban off-road trail extending from Maine to Florida—have galvanized local efforts to eliminate gaps in their trail networks, improve trail/roadway intersections, and develop guide maps. In urban areas such as Portland, OR, and Washington, DC, census data show higher levels of bicycle commuting in census tracts that lie along trails and onroad bikeways. Growing trends in roadway design toward slower operating speeds are making it less comfortable to operate motorized vehicles at high speeds in residential areas. State and local DOTs have begun to reexamine longstanding roadway design practices that have favored generous lane widths and faster design speeds. There is a growing recognition among transportation engineers that urban roadways must be designed to accommodate multiple users, and therefore intersections should be more compact and provide refuge areas for pedestrian crossings. Traffic calming principles have become mainstream in many transportation departments. See lesson 20 for a full explanation of the traffic calming techniques. Professional associations increasingly advocate walking and bicycling. Associations such as the American Association of State Highway and Transportation Officials (AASHTO), Transportation Research Board (TRB), the Institute of Transportation Engineers (ITE), and the American Society of Civil Engineers (ASCE) are putting more and more positive energy into support for bicycle and pedestrian transportation. They are working to educate their members about design planning, construction practices, and related issues. ITE, for example, has published manuals on traffic calming, supports traditional neighborhood design, and is adding new chapters on walking and bicycling solutions to its major handbook and other publications. AASHTO has initiated updates to the Guide for the Development of Bicycle Facilities and is in the process of publishing its first national pedestrian guideline. In addition, engineers and planners in the bicycle and pedestrian field have established their own professional organization—the Association of Pedestrian and Bicycle Professionals (APBP). This organization promotes excellence in the emerging professional discipline of pedestrian and bicycle transportation. There is a trend toward greater public involvement in transportation decisions. The public has become more involved in transportation planning and policy, especially on the local and State levels (see figure 1-7). Federal transportation legislation and a trend toward citizen activism are leading to the formation of bicycle and pedestrian advisory councils in many areas. Combined with existing community organizations, clubs, and advocacy networks, such councils play growing roles in transportation and land use decisions. The following ideas are suggested for student exercises. Take photographs of both good and bad locations to bicycle and walk in your community. Photographs may document conditions in several locations or within one particular development (commercial or residential). 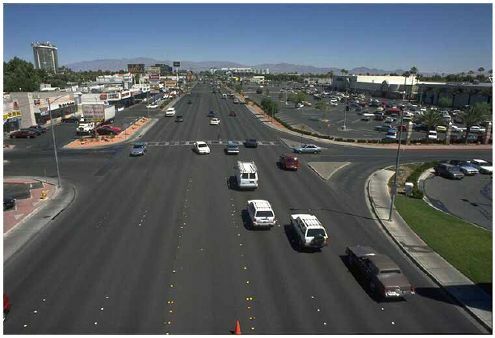 Your photo log should capture the overall environment (such as streetscape), specific barriers and/or good features, and general land use relationships to the transportation facility. For each photograph, prepare a short writeup explaining the problems or positive features you inventoried. Figure 1-7. Photo. 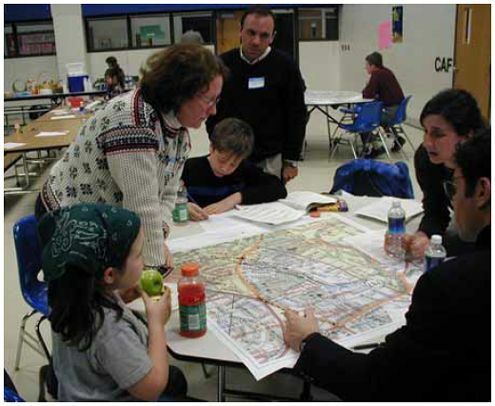 There are growing trends in public involvement in local transportation planning processes. Need for bicycle/pedestrian facilities. How would you establish the need for facilities, whether the existing ones or proposed improvements? What data would you collect? What type(s) of analysis procedures or comparisons would be useful in assessing need? If you documented existing facilities in your photographs, how would you demonstrate effectiveness to detractors who call money spent on pedestrian and bicycles facilities a waste of resources? Please develop some proposed guidelines within the context of effective and reasonable public policy for use by a local agency in addressing issues related to bicycle and pedestrian facilities. 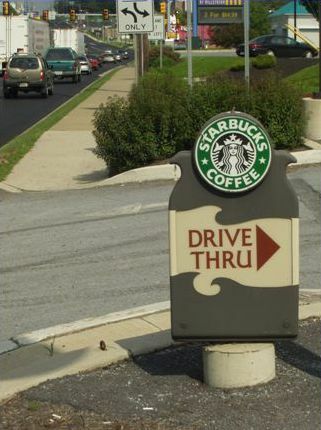 Incorporation of needed facilities in new design. Describe how any deficiencies you noted in your photo logging exercise could have been addressed if pedestrian and/or bicycle facilities were included in the original design and construction. Tabulate and evaluate the associated impacts. If you documented existing designs, describe and quantify impacts associated with accommodating pedestrians and/or bicycles in the facility/facilities you photographed. Incorporation of needed facilities in retrofit design. Assuming that you documented locations deficient for pedestrian and bicycle travel, list and describe possible ways to rectify and retrofit existing facilities so that these locations can more readily accommodate pedestrian and/or bicycle travel modes. Conduct an Internet search to find local land use planning procedures, and document your findings in a one-page report, citing your sources. Critique the organization’s pedestrian/bicycle planning procedures given the new Federal emphasis on pedestrian/bicycle issues. List ten primary and secondary health and societal benefits of nonmotorized transportation. Then write a paragraph for each benefit that further develops each idea listed. Untermann, Richard K., Linking Land Use and Transportation: Design Strategies to Serve HOVs and Pedestrians, Washington State Transportation Commission, Olympia, WA, 1991. 2001 NHTS, available online at http://www.bts.gov/programs/national_household_travel_survey/, accessed August 12, 2005. Plan B, The Comprehensive State Bicycle Plan for Minnesota, Minnesota Department of Transportation, February 1992. Transportation Air Quality: Selected Facts and Figures, FHWA. Washington, DC, January 2002. National Center for Bicycling and Walking, available online at http://www.bikewalk.org/index.htm, accessed August 12, 2005. Ewing R., Schmid T., Killingsworth R., Zlot A. and Raudenbush S., "Relationship Between Urban Sprawl and Physical Activity, Obesity and Morbidity," American Journal of Health Promotion, volume 18, no. 1, September 2003. Berrigan, D. and R.P. Troiano, "The Association Between Urban Form and Physical Activity in U.S. Adults," American Journal of Preventive Medicine, volume 23, issue 2, supplement 1, August 2002. Centers for Disease Control and Prevention, Atlanta, GA,1999. 1999 National Health and Nutrition Examination Survey, available online at http://www.cdc.gov/nchs/nhanes.htm, accessed August 12, 2005. Harris Poll Data published by Bicycling Magazine, April 1991 and by Rodale Press, 1992. National Bicycling and Walking Study, FHWA, Publication No. FHWA-PD-94-023, Washington, DC, 1994, available online at https://www.fhwa.dot.gov/environment/bikeped/, accessed April 26, 2004. Transmittal of Guidance on Bicycle and Pedestrian Provisions of the Federal-aid Program, FHWA, Washington, DC, February 24, 1999, available online at https://www.fhwa.dot.gov/environment/bikeped/bp-guid.htm, accessed April 26, 2004. FHWA Guidance—(February 24, 1999: Bicycle and Pedestrian Provisions of Federal Transportation Legislation, FHWA, Washington, DC, February 24, 1999, available online at https://www.fhwa.dot.gov/environment/rectrails/guidance.htm, accessed April 26, 2004. A Summary of Bicycle and Pedestrian Provisions of the Federal-aid Program, FHWA,Publication No. FHWA-PD-98-049, Washington, DC, 1998. 2002 National Survey of Pedestrian and Bicyclist Attitudes and Behaviors, Bureau of Transportation Statistics, available online at http://www.bts.gov/, accessed August 12, 2005. Americans’ Attitudes Toward Biking, Belden, Russonello & Stewart, April 2003, available online at http://www.americabikes.org/images/resource/media/summary%20of%20stats.doc, accessed August 12, 2005. America Bikes Web site, 2004, available online at http://www.americabikes.org/, accessed April 28, 2004. Appleyard, Donald, Livable Streets, University of California Press, Berkeley, CA, 1981. Complete Streets Fact Sheet, League of American Bicyclists, Washington, DC, 2004. FHWA Bicycle and Pedestrian Program, 2005, available online at https://www.fhwa.dot.gov/environment/bikeped/index.htm, accessed March 21, 2005. Jacobs, Allan, Great Streets, The MIT Press, Cambridge, MA, 1993. PBIC: Policy and Planning Page, 2004, available online at http://www.walkinginfo.org/pp/index.htm, accessed April 26, 2004. Whyte, William H., City: Rediscovering the Center, Doubleday, New York, NY, 1989.